An essential measure of the strength of a school is its Alumni. Schools with healthy Alumni involvement and support add immeasurable benefits to an institution, from admissions and development to networking and prestige. Assuming that your institution already produces an amazing student experience, you still need an Alumni Relations program to keep those students attached to their alma mater. It’s true that these people are students for 4-8 years and alumni for the rest of their lives — but the years that they spend on campus form the foundation of most of their lives (and 100% of the alumni relationship they have with the university). 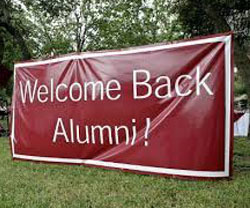 One way to keep them involved in the alumni relations program is to catch them as graduates, getting them to help in orientation, hosting alumni events, and connecting them with other alumni in the same field. But those who ‘got away’ and need to be reeled back in need a coherent and organized effort to reconnect them to their former school. If you can reach out to them, you’ll find that alumni are invaluable — not just as sources of donations, but as centers of social media outreach, sources of expertise and advice for the school itself, and as mentors for new graduates. It all starts, though, with that initial connection. How and what are you communicating to your alumni? Do they know what’s happening at the school right now? Do they know the good, the bad, and the hopes you have for the future? Do they even know that there’s a fellowship of alumni out there? Are they aware of your current research projects? Of cultural developments that have emerged from the institution? Would they know how to get re-involved with the school if they wanted to through your college alumni relations program? Most importantly — can you communicate something to them that will help them recognize how profoundly their time with your college or institution changed their lives? Some of our customers in the education sector are doing that right now through the use of our digital publishing solution 3D Issue, which helps them communicate effectively across all technical platforms. Each of these magazines can reach their widest possible audience because they can be read on tablets and mobile phones, on Mac or Windows based machines. They can be read online or offline. They can even be distributed through the most popular app stores as Alumni branded apps. The magazines offer more that their print counterpart because they have embedded video files, they have embedded audio files and they use photo galleries to convey more of those “Kodak moments”. Most importantly, through SEO integration with Google Analytics you can measure what they are reading and can pivot to ensure the information you are communicating is the most relevant to your audience. Start communicating more effectively with your alumni audience, download a 14 day free trial and watch your alumni become more engaged.